When the UM athletic department announced Mark Richt as the new head football coach to lead the Hurricanes in 2015, the goal was to bring the program back to national prominence. Now ranked No. 8 in the country, the Canes are on their way. But to continue to grow and excel as a team and university, UM facilities must improve alongside them. “To be one of the best programs, you need one of the best facilities,” Senior Associate Athletic Director of Development Jesse Marks said. That’s why in September 2016, the athletic department announced plans to build the Carol Soffer Football Indoor Practice Facility, complete with state-of-the-art technology to complement the outdoor Greentree Practice Fields. The university already has more than $32 million of the $34 million needed to cover the costs of the building, and Marks said the department is moving through the construction process and anticipates the facility will be ready for use by August 2018. Miami football misses days of practice each season because of inclement weather, but now the team will be able to play inside when there is rain, lightning or multiple days of brutal heat. “It’s very hot right now, and if you tell the guys Thursday, after three to four days of hard practice and heat indexes over 100 degrees, ‘Hey, we’re gonna move inside for practice today,’ it really rejuvenates the body and lets them refresh, refocus and refuel in a climate controlled environment,” Marks said. The new facility will cover the south side of the Greentree Practice Fields. It will cover 81,000 square feet and hold two practice fields. Part of the construction is on new space and part is a renovation of previous space. The majority of costs for the structure of the building and its components have been covered, but now the department is planning the building’s interior. While the facility will be available for the team to practice by fall 2018, the outfitting of the interior will be a process. The facility will also include a strength and conditioning center and a video center with large interactive touch screens. 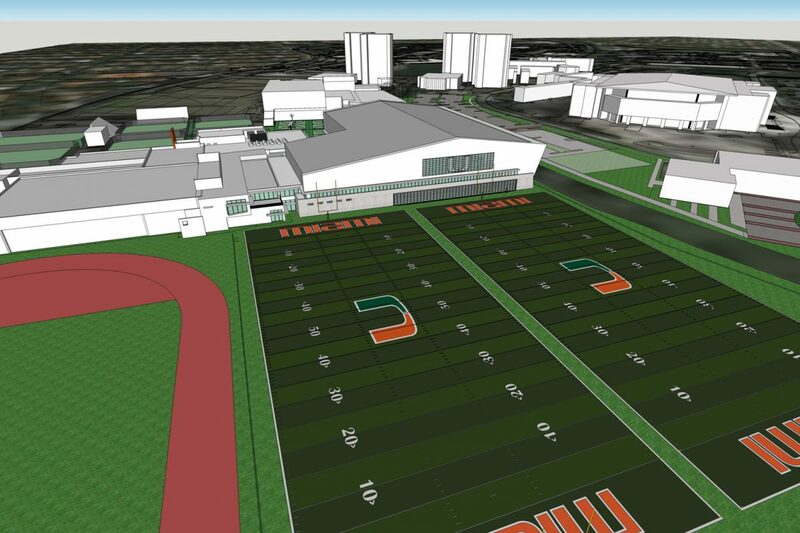 It will connect to the Hecht Athletic Center, the Schwartz Center for Athletic Excellence and the weightlifting gym, so student-athletes can easily walk right into the indoor fields. UM’s athletic department received $14 million from its lead donor, billionaire real estate developer Jeffrey Soffer and his family, at the time of the announcement. Richt and his wife Katharyn donated $1 million, and the campaign received seven-figure commitments from strong supporters of the Hurricanes. The department raised more than $30 million through 350 Canes supporters in just 11 months and is now using technology to look for new donors. Miami announced the creation of Give2IPF.com, a crowdfunding campaign focused on outfitting the interior of the practice facility, on Aug. 28 – the first of its kind for UM athletics. In two months, the campaign raised $315,352. 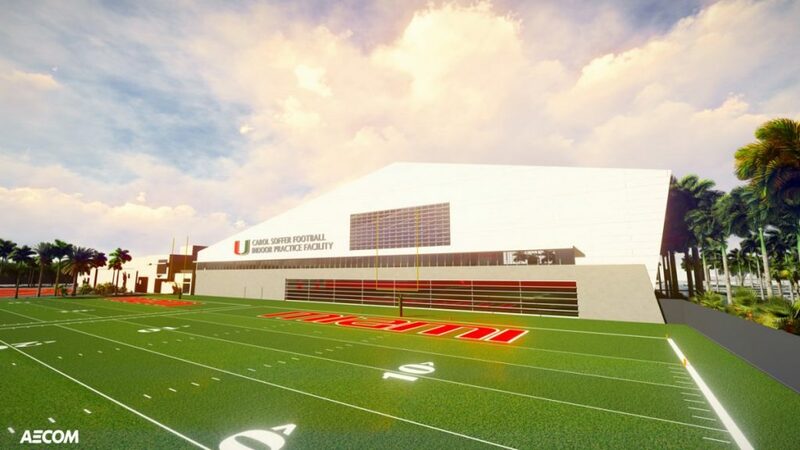 The Carol Soffer Football Indoor Practice Facility is the second-largest athletic campaign in UM history – the first being what is now the Watsco Center, costing around $40 million – and it is being supported fully through philanthropic efforts. “This is coach Richt’s vision – he knows exactly what he needs for this building,” Marks said. “I have seen every facility in our conferences and many others, and I can confidently say that Miami’s will be the premier facility in the United States … The best,” Richt said.